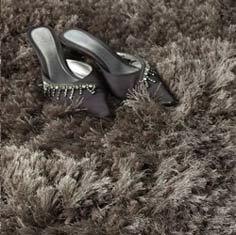 Lustre shaggy rugs, fibres that catch and reflect light to give a soft, almost metallic shine to these deep pile, shaggy rugs. High quality wool & polyester rug with an extra long luxurious pile. This range is woven on traditional hand operated looms, this ensures each rug is unusual, charming and natural in character and texture. The pile is made from pure wool and polyester strands this gives the rug a matt look with glossy highlights. Lustre rugs are made in India, the pile is around 7cm in length and the weight is a staggering 4800g/m2. Lustre shaggy rugs are made in 4 standard sizes, this range can also be custom made to your required sizes.